If you are morbidly obese and your consistent efforts through exercise and diet control have failed to yield any positive results, the best option is asurgical procedure that promises to help you lose weight and is also completely adjustable and totally reversible. 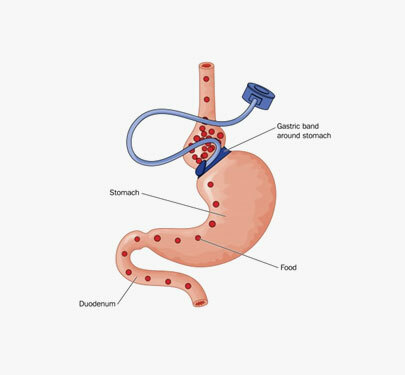 Laparoscopic Adjustable Gastric Banding (LAGB) is used to treat severe obesity, which is linked to high blood pressure, high cholesterol, type 2 diabetes, sleep apnea, and arthritis. Your doctor might recommend LAGB if you have a body mass index (BMI) greater than 40. Your doctor might also recommend it if you have a BMI between 35 and 40 and a medical condition such as sleep apnea, high blood pressure, heart disease, or type 2 diabetes. Laparoscopic gastric banding is both adjustable and reversible. It restricts the volume of the solid food that you eat without interfering with your body’s ability to absorb nutrients. There is no permanent change to your anatomy, and the procedure can be reversed if necessary. band creates a smaller stomach pouch, restricting the amount of food that can be consumed at one time. The band also increases the time it takes for the stomach to empty. As a result, patients achieve sustained weight loss by limiting food intake, reducing appetite and slowing digestion. The gastric banding procedure works by restricting the amount of food the stomach can hold. There is no cutting or stapling needed to separate the upper stomach pouch from the lower stomach. The Gastric Band can be adjusted to suit your needs. At Allure MedSpa obesity is managed by our multi-disciplinary team including doctors, dieticians, surgeons, nurses and psychologists under the able competence of internationally acclaimed surgeon Dr. Milan Doshi. The Gastric Banding is done using minimally invasive laparoscopic surgical methods along with the latest de-risking techniques. We endeavor to make the erstwhile perceived complex bariatric procedures doable in least time, less scarring, reduced discomfort (pain-free), and much shorter recovery time. The procedure takes about 40 minutes and can be performed on an outpatient basis with no required hospital stay. Recovery times may vary, but patients can generally return to work and normal activities within four to seven days. Because the surgery uses laparoscopic techniques, patients experience less post-operative pain, recover quicker and are able to return to normal activities sooner, compared to other forms of bariatric surgery. Allure MedSpa which is renowned for its state-of-the-art internationally acclaimed services, offers affordable and cost effective bariatric procedures. To know more about the cost of your procedure request a consult by filling the form below.Your surgeon will be able to offer you full explanations and answers to all of your queries. I was obese and this was making my life hell. Few years back I was suffering from depression. This made me an emotional eater. To give relief to myself, I sought refuge in eating that gave me pleasure. In no time I became an obese person. It became difficult for me to sit even normally. I had to quit office as the constant look of my colleagues started disturbing me. I was very upset. One day my wife suggested me to undergo a surgery. We searched through the internet but the cost of the surgery was too high in Russia. Even if I contemplate to go for the surgery, I will have to spend all my savings. I could not search for a way out. Instantly, a pop up hit my screen that mentioned about the Allure Medspa. I instantly made a call to enquire about the cost. To my surprise, I got to know that the surgery is quite affordable. I had a long chat with Dr. Milan Doshi, who asked me send my pictures and the problem areas. I immediately did that. After evaluating my body and the problem areas, they mailed me a quotation of the cost. I found that the surgery is quite affordable there. Next day, I booked my tickets for India along with my wife. I reached here and checked with Dr. Doshi. He asked me to visit him next day for the surgery after he diagnosed me and suggested to undergo the laparoscopic gastric banding procedure that will create a small pouch of my stomach, thus controlling my craving for food. The surgery was done in an hour and I stayed at the hospital that day. Next day, I was discharged. However, Dr. Doshi prescribed me a list of medicines and instructions that I needed to follow. It\'s been six months after the surgery and I have started getting results now. I could not have been much happier. I have gained my confidence and have even started going to office. I don\'t get those strange stares now. All thanks to Dr. Doshi and the team of Allure Medspa. If Your BMI has been over 40, or between 35 and 40 with 2 co-morbidities (obesity related disease, for example, high blood pressure, diabetes, arthritis) and your consistent efforts through weight loss and diet control have failed to yield any results, our surgeon will consider your chances and help you in taking the best decision. At Allure MedSpa, we offer a comprehensive aftercare programme following weight loss surgery to ensure that you change your eating habits and lifestyle choices to ensure long-term success. The procedure generally delivers weight loss of 50–60% of excess weight in 2 years. You will be on a liquid diet immediately after surgery. This is followed by a slow transition to small, healthy meals of regular food. The band is first adjusted about six weeks after surgery, and future adjustments are determined by your weight loss and the amount of food you can eat. The results from Gastric Banding can be sustained for life provided you follow the Allure MedSpa aftercare instructions and adhere to the dietary and lifestyle changes prescribed. Our comprehensive aftercare program offers you the support and encouragement you need for long-term success. However, these results may vary widely. 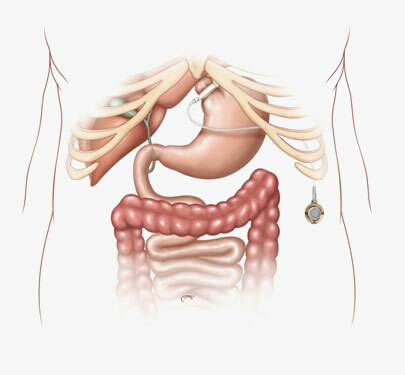 Gastric banding procedure can be reversed if necessary, and in time, the stomach generally returns to its normal size. Laparoscopic surgery carries fewer risk factors than open surgery because you don’t need a major cut, or incision. Although complications from surgery are less common with laparoscopic surgery, they could include blood clots, bleeding, or infection. Other LAGB complications can include band slippage, puncturing the stomach, or blocking the flow of food through the band. Yes, it is a very safe surgery. The incisions made in the surgery is quite small. No foreign element is introduced in the body and no removal of skin and tissues is done. With a little amount of exercise and consuming balanced diet will help in maintaining your weight. Dr. Milan Doshi will discuss about its side effects during the consultation process. What is the recovery period of the surgery? The surgery takes an hour to conclude and the patients typically spend less than 24 hours in the hospital. In a week’s time the patients can resume with their work. In six months the patient can start with their daily exercises. It varies from person to person. However, you will have to follow certain discipline for a quicker weight loss. You should be committed to your new lifestyle and good eating habits. It is important to set achievable target of weight loss at the beginning of the surgery. Otherwise, you will be disappointed. Your main aim should be to get more fitter each passing day. Can I continue with my physical activity after the surgery? The surgery will not affect any type of physical activity such as aerobics, yoga or any form of exercise. However, you should avoid it immediately after the surgery. Your surgeon will advice you about it. The band is not supposed to be removed. After the removal your stomach will generally return to its original shape. There is possibility that you might get back to your original shape or gain weight after it is removed. Will it have any effect on pregnancy? Becoming pregnant gets easier if you lose weight. Good news is that the menstrual cycle will also become regular. The band can be loosened and adjusted if you feel like eating more during the pregnancy. The band can be made tighter after the pregnancy so that you can resume losing weight. Alcohol has a high number of calories. Therefore it should not be made a regular habit. Occasional drinking is fine. What is the cost of Laparoscopic Gastric Banding?